I was hoping that Santa would bring me a neon beanie for Christmas. Especially after I saw post from Helena of Brooklyn Blonde and Krystal of This Time Tomorrow rocking their own neon beanies. Thankfully Santa Brian bought me my neon beanie that I had wanted from Topman, which by the way is cheaper then the Topshop beanies...Now I'm slightly obsessed with my beanie want them in more colors. I have a feeling that I'm going to have a collection of beanies soon. 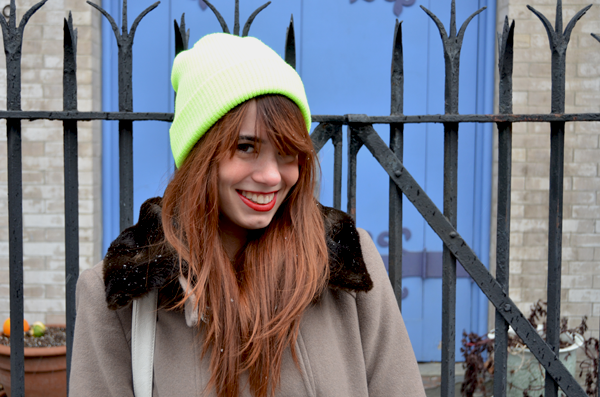 What do you think of the neon beanie trend? I wish I could pull off a neon beanie as well as you do! I've always thought hats do not look good on me, but maybe I will give it a try. Such a cool look! You really pull it off! I found the prefect beanie at target in men's section i love it! but I really like yours and those pants are pretty awesome! Amei o look, está linda!!! 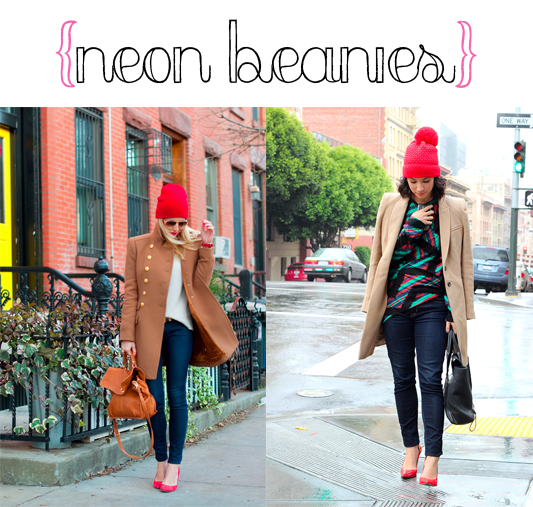 I had never considered a neon beanie prior to this, but this post has left me with a strong desire for one ... even though I live at the Equator ... which is probably the reason why I have never considered one. Neon for the eternal win! Neon beanies! You're so right :) they rock. And you rock it most! I'm loving that bright green color and all of the inspo that you pulled. I am loving this look! the pop of neon look genius! Would you like to keep in touch following each other? let me k now! Such a cute look! Loving your pants and beanie! May just have to add one to my wardrobe! I love it! I have a neon blue one and it is so, so fun. 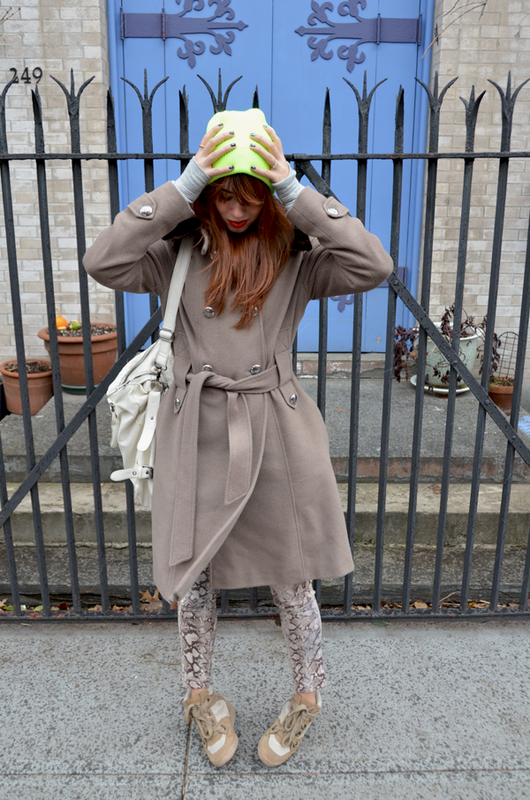 Would love to hear your thoughts on my latest outfit post! OBBBBSESSSED with the neon beanies! They are just too cool!!!! Loved the instagram snapshot of this outfit and love seeing it in full now! So cute! I love the beanie trend. They've been my "go-to" for quite sometime. Love those printed pants as well. I think I wear a beanie like 4 times a week. No joke. Love 'em! Wow, you look so cute in your neon beanie! This is one thing that is sorely missing in my closet! It is a very fun way to add color, and I love the way you paired yours with sneakers. Very cool and casual chic! This is gorgeous, Heather! The neon green looks fab with your hair color! 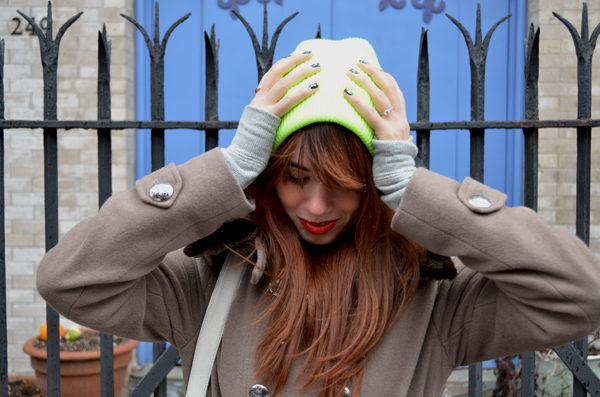 LOVE a neon beanie...takes every look up a wattage ;) We have done this a couple times on our blog!